The Boston Marathon is a huge event in the northeast that so many Americans look forward to. It’s a yearly occasion and a huge goal that many US athletes train all year just to be able to compete against there own best time. This year it’ll be remembered for something far more serious and sinister though. 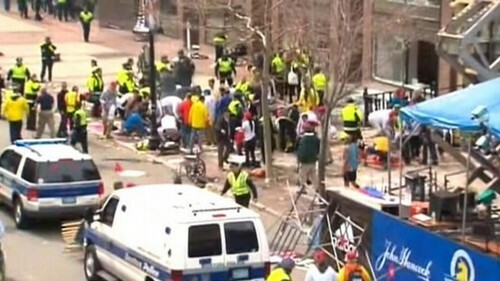 At about 2:50pm twin explosive devices were detonated about a mile from the finish line and as of this moment The Boston Globe is indicating that at least 100 people have been injured. The police are confirming two deaths but quickly add that there are multiple casualties at each bomb site so we are expecting that number to climb. A press conference also is confirming that a third device went off at JFK Library near Harvard. Needless to say everyone is a nervous wreck as news outlets such as CNN are starting to use words like Al Qaeda and Muslim Extremists. The single most goal of a terror attack besides causing injury, is to cause wide spread fear and we are seeing this feeling of dread start to spread as more information starts to become available. U.S. Cities across the country are taking extra precautionary measures and cities such as Washington D.C., NYC, L.A. And San Francisco are now on high alert. The FBI has called this a “well planned attack” and I think everyone is just hoping that it’s over and that law enforcement gets to the bottom of it really quickly. In the meantime, expect more news to keep coming throughout the next several hours. Police supposedly have been discovering and detonating suspicious packages and supposedly they’ll have a clue of what type of organization is responsible just by the contents of the explosives.